There is currently a nationwide shortage of professionals working in the field of radiology technology. While the demand for x-ray technologists has remained steady or grown slightly in most parts of the country, the number of available practitioners has decreased. Although the number of technologists has declined at a slightly slower rate in Arizona than in the rest of the country, the state is still a great place to pursue this career. The shrinking field means that current graduates in radiology technology are more likely to find a well-paying job upon earning their degree. The average annual salary for an Arizona professional in the field of radiology science is $64,120 according to the US Department of Labor. Cities in less densely populated areas in Arizona such as Kingman and Prescott also tend to offer somewhat higher average salaries than a dense urban center like Phoenix. Radiology science salaries have been on an upward trend in Arizona, and continue to lead the average for all professions in the state. More information on Rad Tech salaries in Arizona. 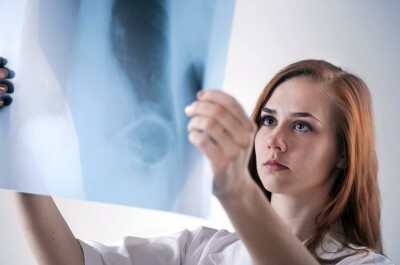 Arizona professionals in the field of radiology technology from limited license X-ray technicians to radiologist assistants must pass the appropriate American Registry of Radiologic Technologists (ARRT) exam. Practitioners working in nuclear medicine must also pass the Nuclear Medicine Technology Certification Board (NMCTB) exam. Limited license X-ray technicians who want to practice in Arizona must complete a limited license program within the state of Arizona. Pima Medical Institute: Pima Medical Institute has multiple locations around the western United States, including Tucson, Phoenix and Mesa. These locations offer an Associate of Applied Science degree in Radiography (Radiologic Technology) for new professionals, as well as an online advanced track in radiography for students with some prior radiology technology training. Current radiologic technologists may also earn a Bachelor of Science in Radiologic Science completely online in order to be better qualified for advancement in their field. Several other schools around Arizona offer Associate of Science degrees in radiologic technology. These schools include Arizona Western College in Yuma, Central Arizona College in Coolidge between Phoenix and Tucson, and Pima Community College in Tucson. These schools offer more of a traditional community college experience for students who are looking for more than just a fast track to a degree. Additionally, Arizona students can look outside the State (note that public universities and colleges will charge more for non-residents). There are good options in Southern California in general, and Los Angeles in particular, in Henderson and Las Vegas, NV to the north, limited options Albuquerque, NM and in Salt Lake City, Utah. Further afield you can consider x-ray technician schools in Colorado and Texas. Radiology science professionals in Arizona are well advised to use the resources available to them through their professional organizations. Societies such as the Arizona State Society of Radiologic Technologists (ASSRT) are able to help technologists make professional contacts and stay abreast of any changes in state regulations. The ASSRT is the Arizona affiliate of the American Society of Radiologic Technologists (ASRT.) Technologists in Arizona should also be familiar with the Arizona Radiation Regulatory Agency (ARRA), which oversees licensing for the state. Large hospitals and medical centers are by far the largest employers of radiologic technologists. These large institutions are also generally able to offer the most competitive wages. Here are some of the most significant employers in Arizona in the field of radiology science.